Chapter-length overview of Babi and early Baha'i history. 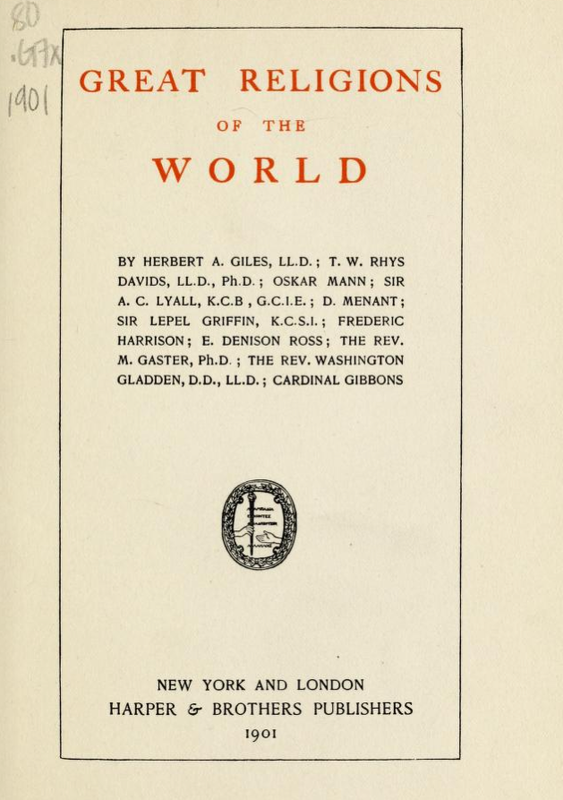 Both editions of this book are online in a variety of formats at archive.org: 1901 edition and 1912 edition, which has additional material on pages 187-188. Also published in The North American Review, volume 172, pages 606-622; see archive.org. Mirza Ali Mohammed, founder of the Mohammedan sect in Persia, whose doctrines have been denominated Babism, was born in Shiraz about 1824. Of his family, education, early occupation, call to found a new sect, subsequent career, and death at the hands of a fanatical mob in Tabriz in 1850, Professor Ross has given graphic details in the accompanying essay on Babism. When Mirza Ali Mohammed undertook to institute a new religion, he drew freely upon Mohammedan, Christian, Jewish, and Parsi doctrines, and assumed the name first of Bab-ed-Din (Gate of the Faith), then of Nokteh (the Point), and later, simply that of Bab (Gate). Since his death he has been designated as the first Bab, to distinguish him from followers who assumed the same appellation. He claimed to be not merely a prophet, but a personal manifestation of the Deity; not merely the recipient of a new divine revelation, but the focus in which all preceding dispensations would converge. All individual existence he regarded as emanating from the Superior Deity, by whom it will ultimately be reabsorbed. He attached special importance to the number 7, as indicating the attributes displayed in the act of creation, and to the number 19 (in addition to the reasons stated by Professor Ross), which he claimed mystically expresses the name of the Deity Himself, and is the sum of the prophets among whom the last incarnation of the divine nature is to be distributed. It is interesting to note that he recognized the equality of the sexes to the extent of providing that at least one of the nineteen prophets must always be a woman. His creed conserved the highest type of morality, forbade concubinage and polygamy, relieved women of the custom of veiling the face, discountenanced asceticism, prohibited mendicancy, and taught hospitality, charity, generous living, and abstinence from intoxicating liquors and drugs. Early in 1912, Abdul Baha, leader of the sect since the death of Baha Ullah, his father, in 1892, came to the United States to promote the spread of the Babist or Bahaist doctrines. THE general reader’s knowledge of Persia and things Persian is usually limited to the bare facts that the country is ruled by a Shah, and that in times past it has produced one or two poets. Some know that Mohammedanism is there the prevalent religion; but beyond such knowledge few have penetrated. Considering, then, the limitations of our general knowledge on the subject of Persia, it is a matter of small wonder that a religious movement in that country, however great its magnitude, and however far-reaching its consequences, should escape the attention of the Western world. In the present article we have to deal with no mere religious reformation, but with the foundation and rise, in the middle of the nineteenth century, of a new faith. In its early history, as we shall see, it has much in common with Christianity, as also in the matter of doctrine, emphasizing, as it does, the brotherhood of man, and aspiring to a universal reign of peace, love, freedom, and unity of belief. died in infancy. He was at this period settled in business at Bushire; and, from that port of the Persian Gulf, he went to Kerbela and attended, as we have said, the conferences of Sayyid Kazim, Here he remained for a few months, and then departed as suddenly as he had come, returning to Shiraz. Not long after this, Sayyid Kazim died, without, however, nominating a successor; and this fact, as will be seen, is of the utmost importance in the history of the Bāb. Shiites, who believed that the Bāb’s teaching was the fulfilling of the Koran. Men who saw in it a hope of national reform. Those to whom the life and teaching of the Bāb and Beha appeal in a general way; and among these must be numbered those Western converts who do not fall under the next head. Those who regard Bābism as a fulfilment of Christianity. a heretic, and ordered to remain in his house until further orders. No very strict watch was, however, kept over him, and, like St. Paul before him, he was visited by and conferred with the faithful. for example, concealed among sweetmeats or wrapped in waterproof and sunk in milk. number. There was a sort of apostolic succession among these “Letters,” so that when one died some other Bābi was appointed to his place. The Bāb composed about a dozen works in all, the most important of which was the Bayan, a work containing a precise statement of all the doctrines taught by him during the final stage of his mission. It was, in fact, the Bābi Bible. Leaving the Bāb for a while in the prison of Chihrik, we must turn to consider the fortunes and misfortunes of his now numerous followers. Of the eighteen chosen “Letters,” three fill a most conspicuous place in the early history of the Bābi movement: namely, Mulla Husayn of Bushrawayh, who, as we have seen, was the first convert to the new faith; Mohammad Ali of Balfarush; and a woman named Kurrat ul-Ayn, or “Coolth o’ the Eyn.” To no one does Bābism owe more for its spread throughout Persia than to Mulla Husayn, who, during the Bāb’s confinement in prison, travelled the whole country over carrying the new gospel: visiting, in turn, Ispahan, where he met with much success; Kashan, with like result; Teheran, whence he was expelled; Nishapur, where he made numberless converts, and Meshed, where he was seized by the Shah’s uncle. He managed, however, to escape to Nishapur, whence he set out westward with an ever-increasing band of followers. all to the sword. Soon after this brutal suppression of the revolt in Mazanderan, a similar scene was enacted at Zanjan, in the northwest of Persia; the same story is repeated of bravery, starvation, and death. While the siege of Zanjan was still in progress, another Bābi rising took place in the south of Persia, and the government, being thoroughly alarmed, determined to strike at the root of the matter, and to put the Bāb to death. authorities entertained some hopes of making the Bāb recant by means of threats or promises. At length, finding these of no avail, they passed the fatal sentence, and the Bāb was led back to prison, to spend his last night in company with two faithful disciples, who were condemned to die with him. On the morning of July 9, 1850, Mirza Ali Mohammad the Bāb, Aka Mohammad Ali, and Sayyid Husayn of Yezd were dragged through the crowded streets and bazaars of Tabriz. This pitiful procession lasted many hours, in the course of which Sayyid Husayn fell to the ground from exhaustion and pain. He was then told that, should he now recant, he might have his pardon. Thereupon — whether in a moment of weakness, or, as the Bābis declare, at the command of the Bāb himself, in order that he might convey a last message from the master to the faithful — he bought his pardon at the price of renunciation of the cause, and escaped to Teheran, where two years later he suffered martyrdom. confinement, attracted to his person and won for his faith thousands of devoted men and women throughout the length and breadth of Persia, and having laid the foundations of a new religion destined to become a formidable rival to Islam. His wonderful life needs no comment. If ever a life spoke for itself, it is the Bāb’s, with its simplicity, integrity, and unswerving devotion to the truth that was born in him. Though we of the West may not appreciate many details of his teaching, and though we may fail to be attracted by a faith in which the niceties of language, the mysteries of numbers, and the like play so important a part, yet none of us can help admiring the life of the founder of this religion, for in it there is neither flaw nor blemish. He felt the truth in him, and in the proclamation of that truth he moved neither hand nor foot to spare himself, but unflinchingly submitted to all manner of injustice and persecution, and, finally, to an ignominious death. That he should have attracted thousands to his cause is perhaps not a matter of such great surprise in a country like Persia, where all are naturally disposed towards religious speculation, and ever ready to examine a “new thing”; but his influence penetrated deeper than their curiosity and their minds — it reached their hearts and inspired them with a spirit of self-sacrifice, renunciation, and devotion as remarkable and as admirable as his own. been brief, but enough has, perhaps, been told of his career to suggest to all readers a comparison with the life of Christ. Those whose curiosity or sympathy may lead them to study the Bāb’s life in full detail will certainly not fail to notice in many places the striking similarity which these two lives offer. In returning to our narrative, we find the last, and by no means the least, striking of the coincidences referred to. For the Bāb, too, had his Joseph of Arimathaea. The bodies of the two victims were thrown outside the city walls, to be devoured by dogs and jackals, and a guard was set over them to insure against their being buried. But, by night, a certain wealthy Bābi, named Sulayman Khan, came with a few armed companions, and offered the guards the choice of gold or the sword. The guards accepted the gold, and allowed Sulayman Khan to carry off the body of the Bāb, which, after he had wrapped it in fine silk, he secretly conveyed to Teheran. converts to the “new religion.” The year 1850 witnessed the spilling of much Bābi blood. The tragic story of Shaykh Tabarsi was re-enacted in two different quarters of Persia, and in Teheran seven Bābis were “martyred” in cold blood at the instigation of the prime-minister. Persecutions went on steadily throughout the country, and the Bābis were obliged to maintain the utmost secrecy, being continually in danger of their lives. been employed to destroy the sect, root and branch. Thus, in spite of the utmost secrecy which the Bābis preserved among themselves, they could never feel secure from one day to another within the Shah’s realms. It was on this account that their leaders now deemed it wise to fly the country, and betake themselves to a voluntary exile in Turkish territory; and Bagdad now became the heart and centre of the Bābi movement. Owing to the continued persecutions of Bābis in Persia, the little colony of exiles in Bagdad was constantly receiving additions to its numbers. In order to protect themselves effectually against the Persian government, they enrolled themselves as Turkish subjects; while their exemplary behavior was rewarded by kind treatment at the hands of the Ottoman authorities. In 1864, at the instigation of the Persian government, which objected to their proximity to the frontier, they were removed first to Constantinople and shortly afterwards to Adrianople. It was in this town that an important schism occurred in the Bābi community, which has never since healed. from documentary and other evidence, to be beyond dispute. He laid no claim to prophetic rank. Early in 1853 an elder half-brother of his, named Beha, fled from Persia and joined the community in Bagdad, having, as we have said, come very near to martyrdom in the Teheran massacre which followed the attempt on the Shah’s life. Subh-i-Ezel, while at Bagdad, led a life of comparative seclusion, and trusted to Beha the business of interviewing disciples and corresponding with the Bābis in Persia. At this time, Beha certainly admitted the supremacy of Subh-i-Ezel, and claimed no superiority over his coreligionists; but certain passages in a work called the Ikan, which he wrote while at Bagdad, leave room for the supposition that he already contemplated the idea of putting forward that claim which not long after forever divided the Bābis into two rival factions, the Ezelis and the Behais. What were his actual thoughts and ambitions with regard to himself it is impossible to say; we only know that, in 1866-67, while he was living with his exiled comrades in Adrianople, Beha announced that he was “He whom God shall manifest,” so often alluded to by the Bāb in his writings. religion founded by the Bāb, with its attendant laws and institutions, had obtained currency at least among some of the nations of the earth. It was inconceivable that one revelation should be so quickly eclipsed by another. He found many Bābis who concurred in his views, and were willing to remain faithful to him as the legitimate head of the Bābi Church. The majority of the Bābis, however, accepted the manifestation of Beha, and, in the course of time, their numbers have steadily increased, while the following of Subh-i-Ezel is constantly diminishing. In fact, to-day it is a comparatively rare occurrence to meet with an Ezeli, and one which never came within the experience of the present writer while travelling in Persia or central Asia. * A few Behais were sent to Cyprus and a few Ezelis to Acre. The latter were murdered soon after their arrival by some Behais, but probably without the knowledge of Beha. on the Bābi movement, especially in the New History. Only a very small proportion of the Bābis to-day belong to the Ezeli faction; so it is Acre which now becomes and remains the chief centre of interest in the subsequent history of this religion. It would, in reality, be more accurate to speak of the vast Bābi community which looks to Acre for guidance as Behais rather than as Bābis; for, in many respects, their beliefs bear a relation to the teaching of the Bāb very similar to that of Christianity to the Old Testament; for the revelation of Beha practically abrogated that of the Bāb. But it may be maintained that Beha’s teaching was even more revolutionary than that of Christ; for, whereas Christ came to fulfil the law, and whereas the Old Testament came to be embodied in the Christian Scriptures, Beha has given his followers a new Bible which has rendered superfluous the Bayan. The written works of Beha are numerous, and an authorized edition of them has been lithographed in Bombay in three volumes. 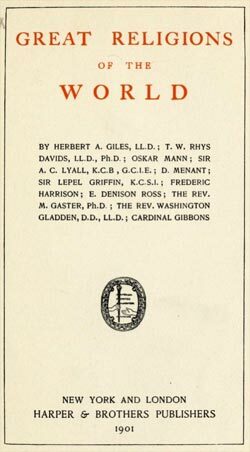 Of these, the Kitab-i-Akdas is, in many respects, the most interesting, and it has the best claim to be regarded as the Behai Bible. Beha also wrote a very large number of smaller treatises and letters of exhortation and encouragement, which are known among the faithful as “alwah” (singular, “lawh”), or tablets. All these alwah emanating from Beha were and are carefully treasured up and diligently copied. They were usually addressed to some prominent member of a local community, and, to be the recipient of one of them, however brief, was considered a very high honor. From the date of Beha’s arrival in Acre, his writings begin to assume a very different tone and character from those which pervade the Ikan above referred to. Seeing that the Kitab-i-Akdas* is not only the most important of Beha’s writings, but that it contains a resume of all his teaching, it is fitting in this place to present the reader with a brief account of some of its contents. The book begins with instructions as to religious observances. Prayers are to be said three times a day. The worshipper is to turn his face towards “the Most Holy Region,” by which Acre is apparently intended. All congregational prayer is abolished, except in the case of the burial service. The Bābi year, which, as we have said, contains nineteen months of nineteen days each, begins on the Persian New Year’s day. The year contains 366 days in all, five intercalary days being added. Fasting from sunrise to sunset is ordained during the last month of the year. * This book was at one time difficult to obtain, as it only existed in manuscript. It has, however, been since lithographed in Bombay, and is therefore fairly accessible. It is composed in Arabic. 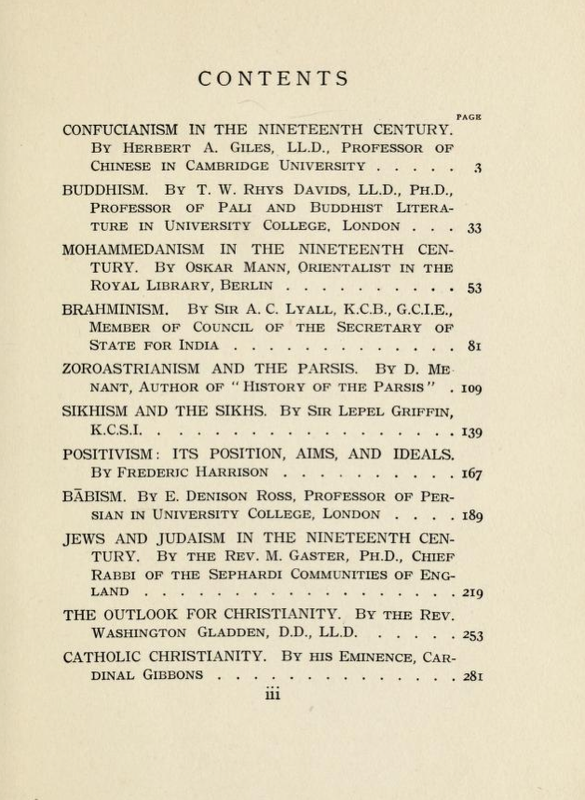 For the following summary of contents I am indebted to an article by Mr. E. G. Browne, without whose admirable writings we should know very little of Bābism in its late developments. who sits and begs; take hold of the robe of means, relying on God, the Cause of causes.” The use of knives and forks in eating, instead of the hands, is enjoined. Cleanliness is insisted on. Marriage is enjoined on all. Wives who for a period of nine months have had no news of their husbands are permitted to marry again, but if they are patient it is better, “since God loves those who are patient.” If quarrels arise between a man and his wife, he is not to divorce her at once, but must wait for a whole year, so that, perhaps, he may become reconciled to her. The kings of the earth are exhorted to adopt and spread the new faith. Wine and opium are forbidden. The sacred books are to be read regularly, but never so long as to cause weariness. Enemies are to be forgiven, nor must evil be met with evil. * To be found on pp. 13 and 14 of the lithographed edition. erence they paid him were unbounded. He had four sons, of whom the two eldest were Abbas Efendi and Aga Mohammad Ali. On the death of Beha, Abbas Efendi, as the eldest son, became the spiritual head of the Behais; though it appears that his claims to this position were not admitted by all, for he found, at the first, a rival in the person of a certain Aga Mirza Jan, of Kashan, who had been the amanuensis of Beha. This rivalry did not however, have any appreciable effect on the position of Abbas Efendi, who receives, at any rate from the vast majority of the Behais of to-day, a veneration equal to that accorded to his father. Aga Mohammad Ali, since his father’s death, has lived a life of retirement and seclusion. It is known that he was unable to approve the course adopted by his brother, Abbas Efendi; but he has always strenuously avoided an open quarrel with him, and has refused to give written answers to the large number of Bābis who were anxious to know his views. His main object has been to avoid any further division in the Bābi Church. the contents of the latest lawh from Acre. During the reading of these letters the strictest silence prevails, and pipes and cigarettes are for the time discarded. In Turkish and Russian territory the position of the Bābis is one of comparative immunity. Askabad, in Transcaspia, is a very important centre, and it is there, perhaps, that the followers of Beha enjoy the greatest freedom. Finally, we must mention the recent spread of this religious movement in non-Mohammedan countries, which is practically confined to the United States of America. From the latest information, it would appear that no less than three thousand Americans now subscribe to the new faith. 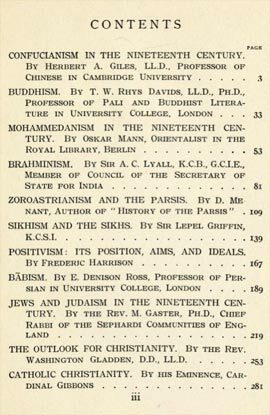 The propaganda first began in 1893, at the World’s Congress of Religions in Chicago, when a certain Bābi, named Ibrahim Kheirallah, who had come to the United States on business, gave a course of fifteen lectures on Mohammedanism and the various movements which had grown out of it. In the course of these “lessons,” he continually referred to the teachings of the Bāb, and in a short time he is said to have secured over one hundred “believers.” He next proceeded to New York City, where he published his lectures. Such were the beginnings of Bābism in the United States. lah, belongs to the party of the latter. The followers of Abbas Efendi, who believe him in all sincerity and devotedness of faith to be the incarnation of God, are known as the Sabitis, or the “Firm,” while those who deny his claims have received from their opponents the name of Nakizis, or “Adversaries.” The principal Bābi centres in the United States are as follows: Chicago, about one thousand; Kenosha, Wis., from four hundred to five hundred; New York City, about four hundred; Washington, Baltimore, Philadelphia; Wilmington and Bellevue, Del. ; Newark, Fanwood, and Hoboken, N. J.; Brooklyn and Ithaca, N. Y.; Detroit, Mich.; Boston, Cincinnati, San Francisco, and Denver. Bābism, though still, as it were, in its infancy, is said to count to-day over one million adherents, and the possibilities of its future success are infinite, for, in spite of internal schisms and external disabilities, there is no falling off either in the number of fresh converts or in the religious fervor of believers.